It’s time for some serious Italian today. And what better day than Monday for Italian, right? It’s gonna put you in a good mood. Trust me. Actually, I’ve been kind of in an Italian mood lately. I’m thinking you’ll be seeing more Italian later this week, hope you are cool with that. So have I told you guys about my dad yet? I mean I know I have talked about him, but have I also told you how amazing he is? Let me just brag about him for a second because it sort of ties into this recipe. See, my parents are currently in Mt. Hood Oregon for a while with my youngest brother Red (PLUS my oldest, second oldest and third oldest brothers. PLUS my brother just below me and little miss Asher (who I miss so much!). They are there so Red can train up on Mt. Hood with the US Snowboard team. They go every summer and this is the first summer I have not gone too. Thank God. I cannot handle anymore snowboarding in my life. A break was necessary. But anyway, my dad works as a bond broker. This means he works on East Coast Time, meaning in Oregon he gets up at 4am for work and finishes at 2pm. This also means that he has some time to kill in the afternoons. You know what he does? He searches for places in Portland to check out on the weekends. What kind of places? Old vintage shops. Shops full of junk that I might possibly be able to use for photos. You see I get really bored of using the same dishes and things in my photos so I am on the constant look out for new stuff… or really my dad is, because he is just the best. He actually takes the time to rummage through all the junk, take pictures of it and send those said pictures off to me so I can look at them and give him the big thumbs up or thumbs down (*Side note: I totally just put my thumbs up and down as I wrote that. Nerd alert). I mean, come on. I am pretty sure I have the bestest dad ever. I also have to give a big shout out to my mom and very sick younger brother Kai (he has strep and they went rummaging after they stopped at the med center) for helping him out this past Saturday. Oh and Asher too, but I am sure she might have done more damage than help. I hear Kai was a major trooper though. So thank you! Mom and Asher always tag along because my parents are weird and never like to be apart. You would think that after 30 years together they might be sick of each other by now, but nope. Also, I feel I should say that my mom wants to help me too just as much as my dad and does not mind spending her Saturday in hot, dirty vintage shops, but my dad’s just really into it. I guess the point of the story is that I am currently feeling really grateful for my parents. I couldn’t have chosen better ones, even if I tried. So how does this all tie into this recipe? While a while back my parents went to Leadville, CO for the day. I can’t remember if they were going just to look at vintage shops or if they had a hike over that way they wanted to do too, but they stopped in a shop and came home with all these old cookbooks. Most of them where duds, but there where two really cool Italian ones that I kept. I hadn’t really looked through them until last week though. And that’s when I came across the Mozzarella in Carrozza. Mozzarella in Corrozza means mozzarella in a bundle (the bundle being the bread) or something like that. I guess “in carrozza” actually means “in carriage”, so mozzarella in a carriage. I think what everybody is trying to get at is the idea of mozzarella encased in bread. Dumbed down to my level, I take it as just some fresh mozzarella in bread that has been dipped in eggs and fried. That’s really all it is. I added basil to mine because it’s summer and I add basil to all my summer meals. All of them. The recipe in the book (which I cannot read the name of because it is in Italian) served this with an optional anchovy paste and while I bet that was good, I did not have any anchovies, so I went with summer fruit. It never fails me. 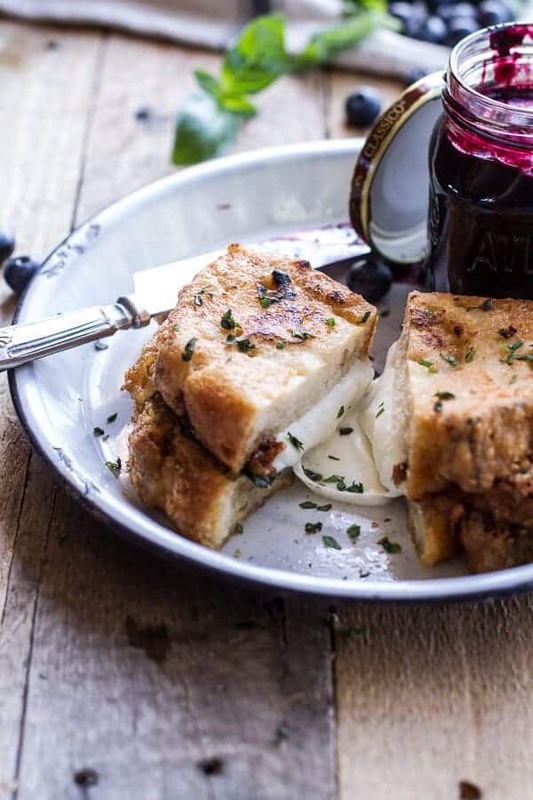 The blueberry balsamic jam is the perfect topper to this mozzarella in carrozza. 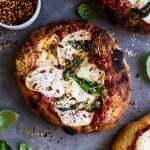 It sinks into the warm and ooey, gooey, melty mozzarella and it is all kinds of delicious. Seriously, it’s the simple things in life that are so good. 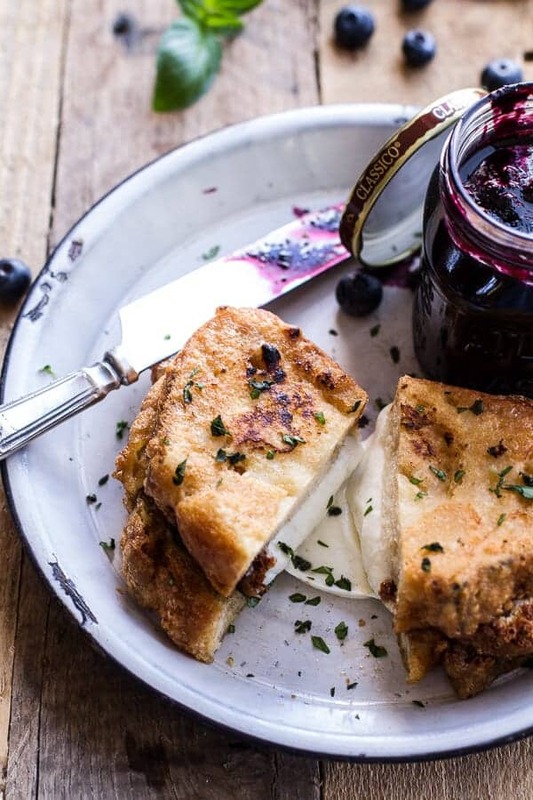 Mozzarella in Carrozza (Fried Mazzarella Sandwich) w/Blueberry Balsamic Jam. Add the blueberries, coconut sugar, balsamic vinegar, and lemon juice to a medium size sauce pot. Place the pot over high heat and bring the mixture to a boil. 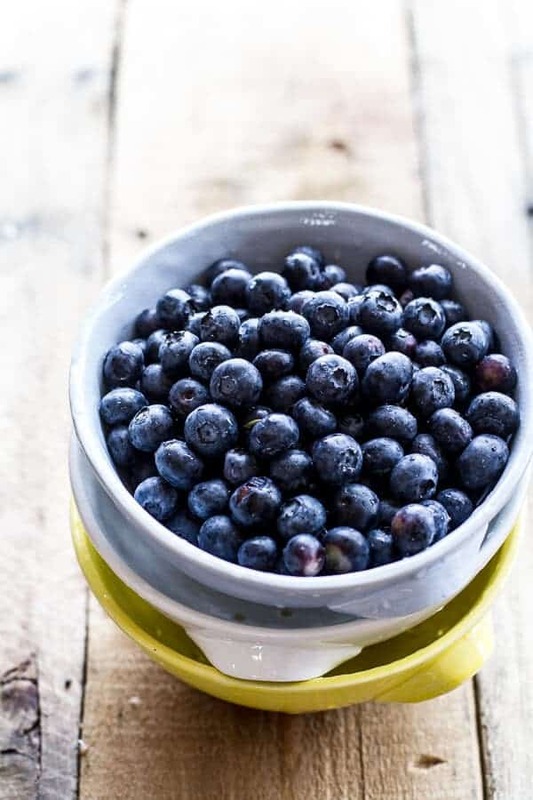 Once boiling use a potato masher to break down and mash the blueberries. Continue to cook for 5-8 minutes or until the jam has reduced and thickened by half. Remove from the heat and stir in 1 tablespoon basil if desired. Store in a glass jar in the fridge for up to two weeks. 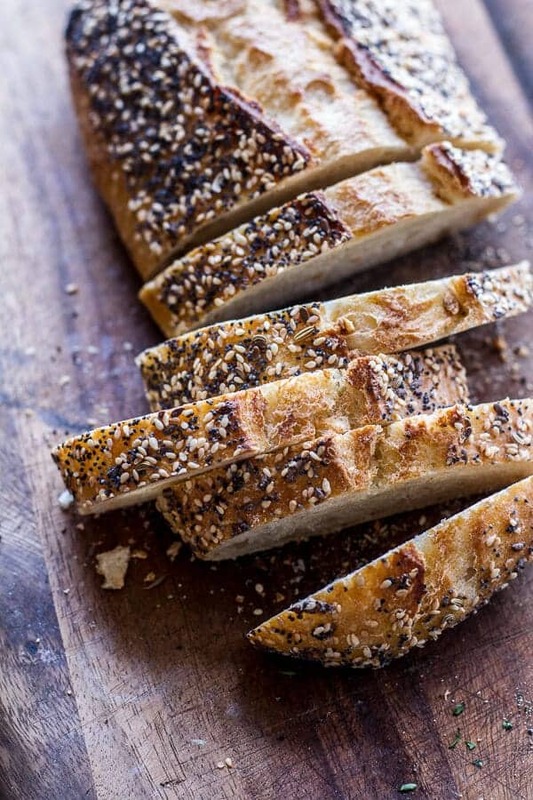 Place the bread slices on a cutting board. 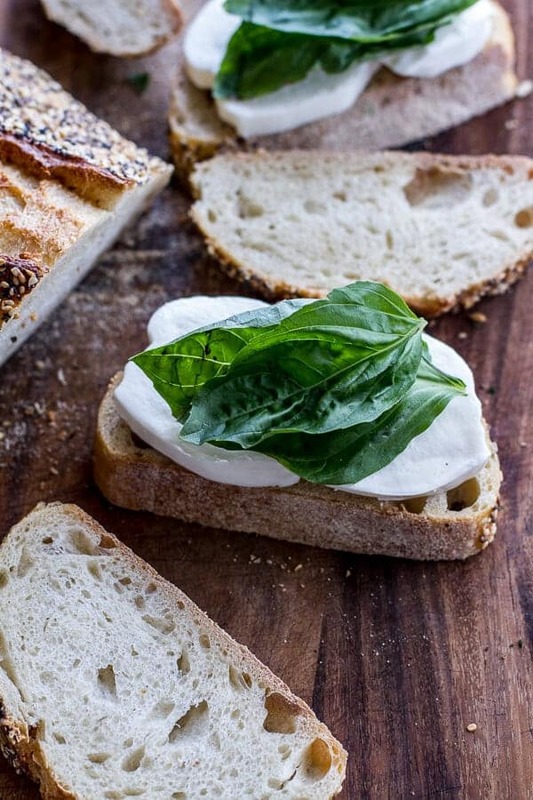 To make tow sandwiches, divide half the mozzarella among two slices of bread and then place the basil on top. Place the remaining mozzarella on top of the basil. Now place the top slice of bread on each of the sandwiches. Next, add the milk, flour and eggs to three separate shallow dishes (I used pie plates). Whisk the eggs. Add the parmesan to the flour, tossing to mix the two together. Add the olive oil to a large heavy bottom pot, filling the pot about 1-2 inches with oil. Warm the oil over medium heat until hot, about 350 degrees F.
Working in a line (milk, flour eggs), dredge both sides of the sandwich through the milk. From the milk move to the flour/parmesan mixture - dredge both sides generously in the flour, then lift the sandwich and dredge the EDGES. Now move to the eggs and do the same, dredging both the sides and edges of the sandwich until completely covered in egg. Place on a plate and repeat with the other sandwich. When the oil is ready place one sandwich in at a time and fry for 3-4 minutes, carefully flip and cook another 3-4 minutes until the cheese is melted and the crust is golden. Remove and place on a plate. 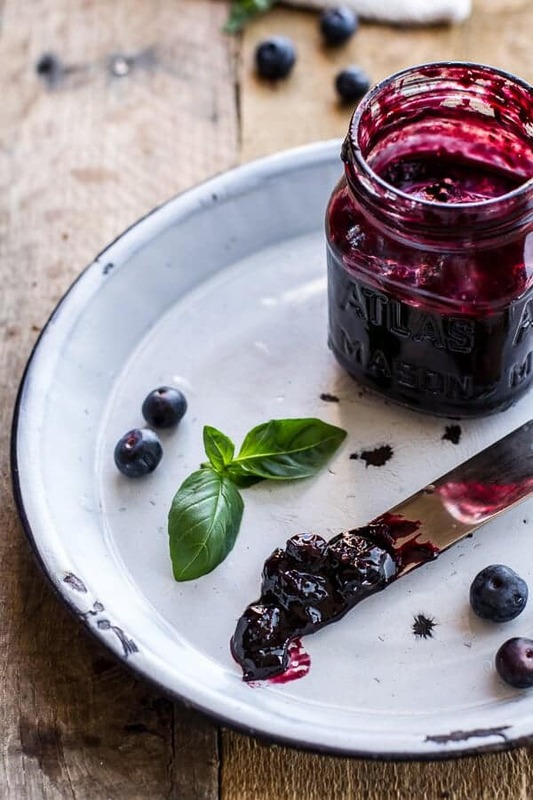 Slice in half, sprinkle with fresh basil and drizzle with the warmed blueberry jam if desired. EAT right then, while melty, hot and delicious! *Inspired from a really old Italian book that I cannot read the name of. Simple and delicious on a Monday – NICE. The Montanara Pizza (Classic Fried Italian Pizza). 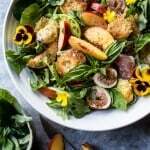 Nectarine and Fried Mozzarella Caprese Salad. 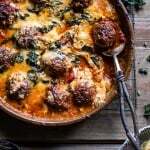 Simple Baked Italian Oregano Meatballs. 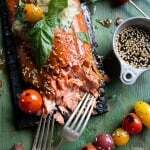 Cedar Plank Grilled Sesame Salmon with Kimchi Miso Butter and Grilled Tomatoes. If you make this recipe, be sure to tag your photo #halfbakedharvest. 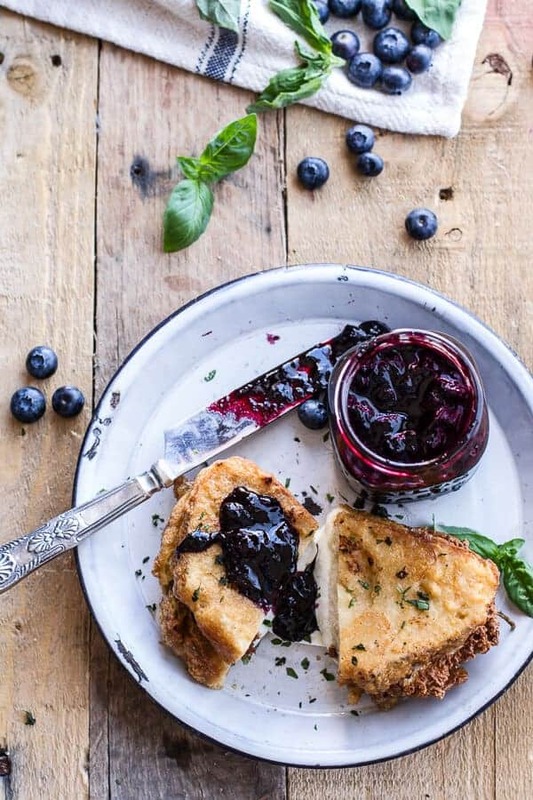 Mozzarella + blueberry…oh my goodness!!! YES I WANT THIS please! Just look at that cheese action!! Just gorgeous. an absolute fave of mine; got a recipe on my blog too. Oh wow look at the spread on that cheese. Wahoo. Looks delish. Your dad really is the best! Most dads would not get that and I love that he sends you pictures too. So sweet. And this fried mozz? I love the concept…like a mozzarella stick but even better! Thanks Bri and yes, is so is!! I AM DEAD for that cheese! Holy Blueberry jam (I was going to say guacamole, but that would be misleading) this looks like it wants a home in my belly. Pinned! Thanks Taylor! I got it at a local shop. Wow this is a new one for me. Mozzarella in Carrozza? I’m not sure I’m pronouncing it correctly but with the fresh blueberry jam this is a must have on the table and soon! This is AWESOME! And your pictures again are gorgeous! 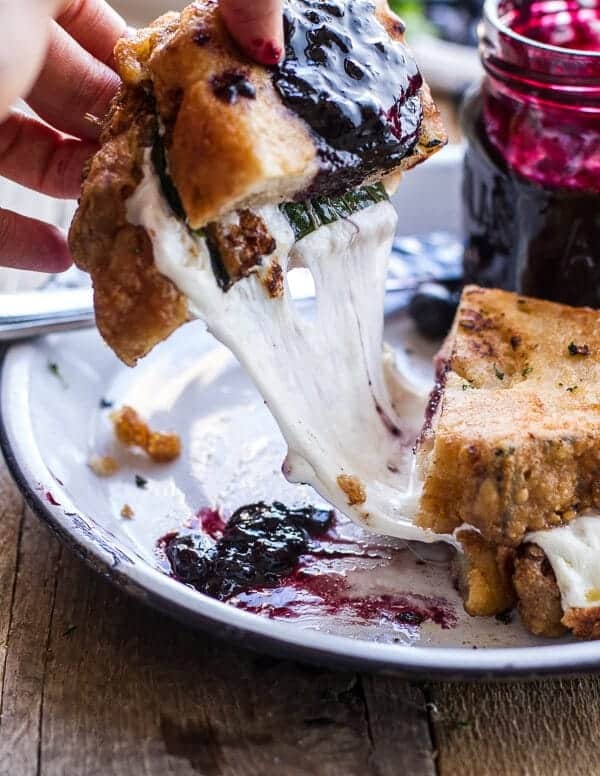 This looks insane…that bread looks so crusty and the melty cheese with the jam…please…I made your grilled brie this weekend and that blueberry jam would have been a great addition. Your parents rule…I love hearing about your family. 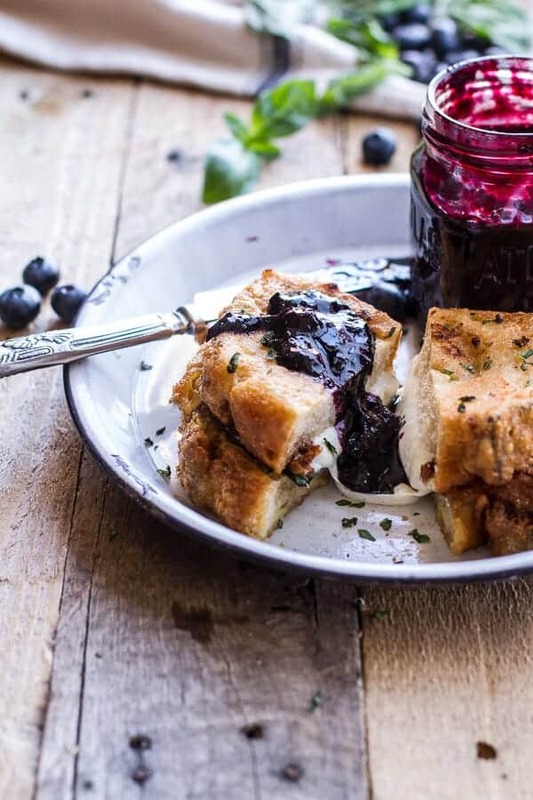 Oh wow… fried mozzarella and blueberries and balsamic! That sounds crazy and amazing 🙂 Definitely going to try this jam! and this sandwich speaks for itself. such amazingness. I’ve eaten something similar to this… except that it also had jalapeño poppers inside it. Woah, heart attack. Yours is gorgeous. Yum! I love combining sweet and savoury like this! You do have a great dad. He’s a rare one. I like how you appreciate him too. It’s special. And so is this sandwich. It looks and sounds fantastic. Tieghan, this is total comfort food to me. My Mom is 100% Italian and would make this for me as a kid growing up. Soooo good!! My neighbor just gave me a quart of blueberries, and now I know just what to do with them. Perfect! Hope you love this! This is just what I need today. It looks so delicious I kind of want to eat my screen. Your dad sounds amazing! I could use someone like that in my life right about now–my dad is retiring soon, so maybe I’ll force the job onto him?! HAH! Thanks Amanda!! And yes, he is a great dad! Whatta dad. And whatta fabulous sammy! Your parents truly sound like the coolest peeps ever! This sando is giving me some serious heart flutter. As in, I need to marry it. Period end. that last picture, i die. Yes, You have an awesome dad!! Omg, that cheese. I can’t handle it! Your parents sound awesome! This looks ridiculous! And what a cute story about your dad! My mom sometimes sends me old pieces that she finds that I can use for my blog. I love it! Old pieces are the best! Thanks Liz! This is GENIUS!!! I need that blueberry jam in my life STAT! Also I would love the mozzarella too, but that may need to wait since I have been eating badly! Haha! Thanks so much, Sophia! Hope you had a good Monday. Is it lunch time yet? 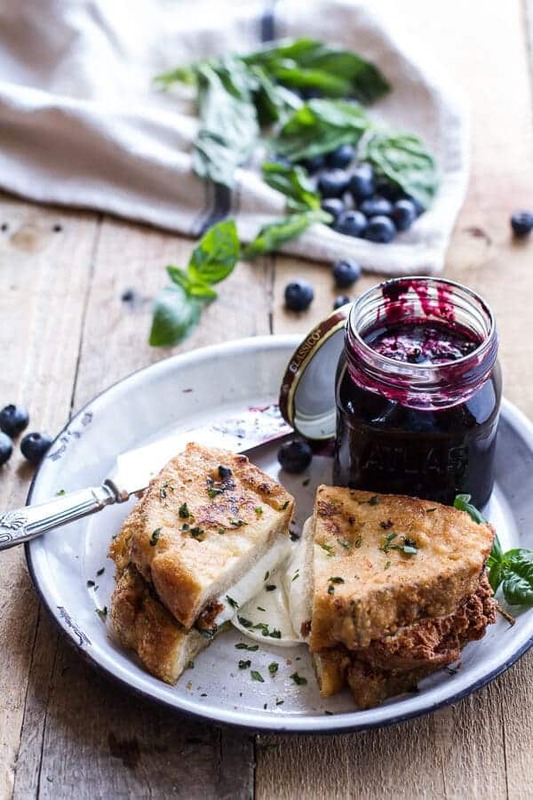 I need this sandwich in my life, love the blueberry jam! Thank you so much, Karen!! They are great parents! Fried mozzarella sandwich?!!! Best thing ever!! Gorgeous pics as always! Oh man, that cheese and the vibrant color of that blueberry jam!!! I love having a great relationship with my parents – they really are the world! You sound like you have a special bond with your family!! What a killer sandwich!! Keep it coming, Tieghan! Thanks Todd! 🙂 Hopping you had a good Monday! This is absolutely genius! Fried… perfect combination of sweet and salty and savory… can’t wait to try this out! You go girl! Your parents seem lovely!! Can’t wait to try this sandwich. Got a kick out of the “canning” jar. Nice to know that a nice little Italian girl like you, who CAN cook, uses Classico sauce as well!! I use it too AND also recycle the jars for other things. I love this. Couldn’t love it more. Can’t wait to try it. Dying for it to appear in my kitchen right now. Aaaah! Yum. Wow! This looks like the best sandwich ever. And yes, your parents seem so very sweet! Thank you for sharing the story and the recipe! oh man this sandwich looks too good to be true! and your parents sound so cute. 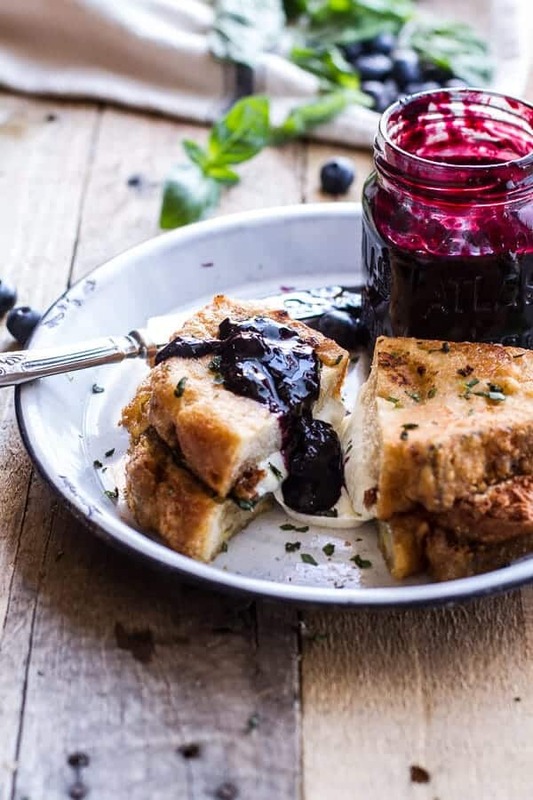 Mozzarella and blueberry jam–that’s my kinds of sandwich! I love pairing cheese and fruit together. It’s SO GOOD! By the way, your parents are the best! WOW! This looks incredible! 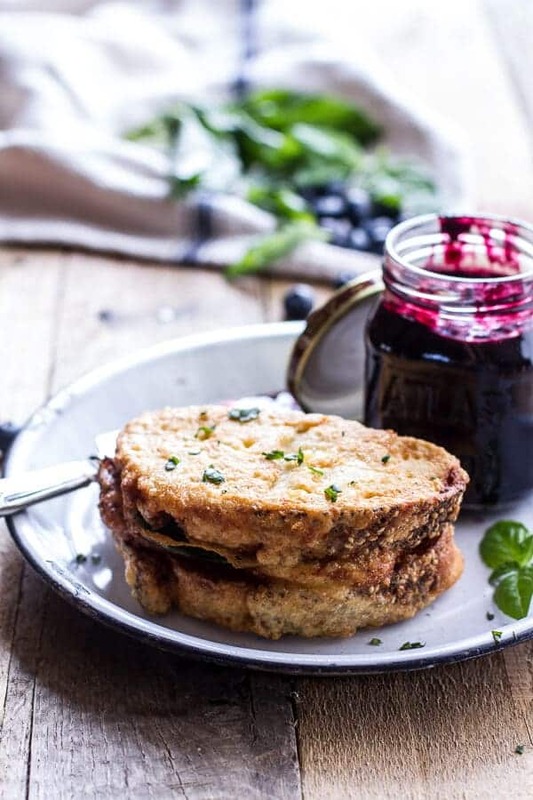 I love the idea of adding blueberry jam to grilled cheese! This looks absolutely incredible. Your photography is amazing! Wow that looks so delicious! I’m definitely going to make that jam!! Thanks! Hope you love it! This is out of this world INCREDIBLE, Tieghan! 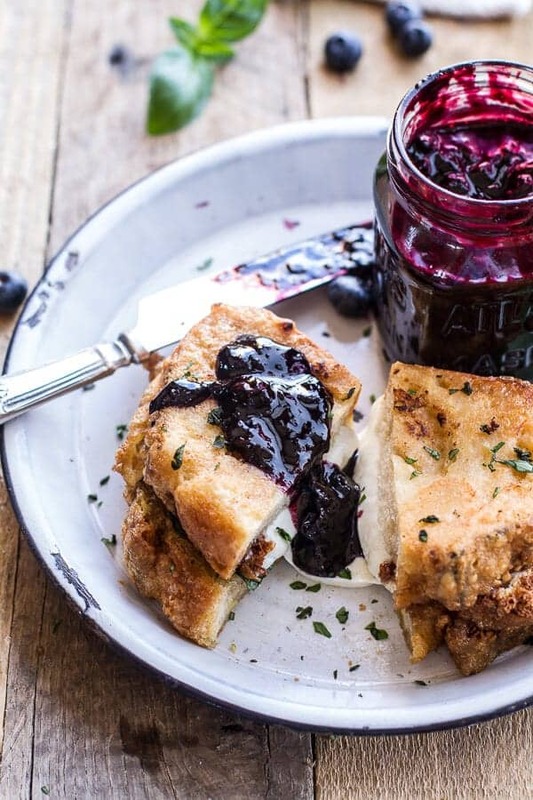 I love the idea of a homemade blueberry jam and that fried cheese sandwich — YESSSSS. Thanks so much! have fun at blog her this weekend! Your parents sound amazing, as amazing as that sandwich. I don’t know what sorcery this is, but I need to make this stat. Like what? Cheese + bread + fried things + basil? AMAZEEEEE. You have some of the most beautiful food photos I have ever SEEN. I am going through all of your recipes and each one is more “wow” than before. What camera do you use? Your site is GORGEOUS. OMG! THANK YOU! That means so much, seriously! Oh wow: delicious recipe and wow! How wonderful is your Dad? (I like to think it’s the sort of thing my Dad would be doing for me, were he still alive). Wonderful post: has really brightened my day. Thank you. learn more of your helpful info. Thanks for the post. I’ll certainly return. This is nice post I never seen.. Thanks! This is nice post Thanks! great food, i like your article and images …thank you for sharing.. I think taste is good, thanks for sharing my boy. Mozzarella in Carrozza is very delicious, can i taste it ? im very hungry right now! hhihihi just kidding. I wish you could!! Hope you get to make it and try!! Oh boy will I be making this. Serious comfort food right here. Gorgeous photos. ? Right?! Such comfort food!! Thanks so much! Nice sharing.. i wanna try it. Hope you love it, thanks! Haha I am glad you are enjoying this recipe! Thanks! it was delicious, thank you for the information, I would like to try her recipes. Thank you, I hope you love it! Hope you love it, thank you! Thank you!! Hope you get to try it!! Haha I hope you try this & like it! Thank you! make me hungry…. send me email if you have another like this. So happy you like it! If you search sandwiches into the search you can see all my recipes like this! How about if you create a post about local recipe ? i mean like a rare local recipe … thats will be great and i’m waiting too for that post on your blog. Hey Reni! That is a great idea. I will totally look into doing something like that! Thank you! Hi! It is at the bottom of my home page! I hope you love the emails! 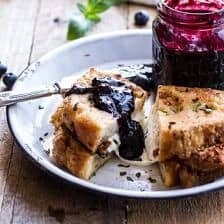 It’s look so yummy and also make me hungry now..
i think i need find some food similar like this one.. thanks man for sharing this awesome food..
i want to eat this melt cheez.. Thank you so much Kursi! I am so glad you like this! I’m Tieghan, the recipes you’ll find here are inspired by the people and places I love most. I try to live simply, eat seasonally, and cook with whole foods. My hope is to inspire a love for amazing food, as well as the courage to try something new! Whether you need to get dinner on the table for your family tonight or are planning your next get-together with friends, Half Baked Harvest Cookbook has your new favorite recipe. The HBH Studio Barn: Kitchen and Downstairs Bath Plans. Let's Be Friends Get exclusive recipes, tips and more!